Toronto Mayor Rob Ford is in hospital, diagnosed with a tumour following complaints of abdominal pain, his family confirmed Wednesday, but there is no sign that he intends on dropping out of the mayoral race. Toronto Mayor Rob Ford has been admitted to hospital following a diagnosis of a tumour, Humber River Hospital officials and Ford’s family confirmed Wednesday, but there is no sign Ford intends on dropping out of the mayoral race. 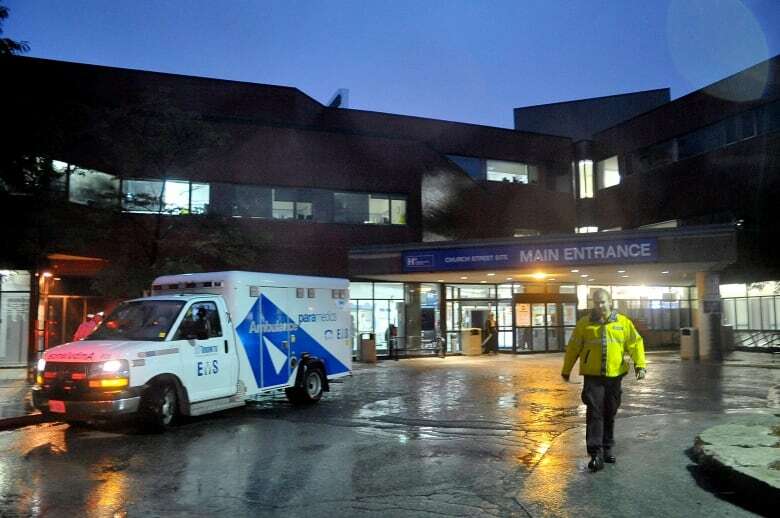 "The tumour is in his abdomen, that’s our working diagnosis based on a CT scan," said Dr. Rueben Devlin, president and CEO of Humber River Hospital, where Ford is currently staying. "It's being investigated further and we need to determine exactly what type of tumour it is," Devlin said at a news conference held at the hospital’s Church Street site (near Jane Street) Wednesday night. Devlin added that Ford will undergo a biopsy in the coming days. Ford's brother, Coun. Doug Ford, said the mayor complained of severe abdominal pain at breakfast earlier in the day, and went to see his physician shortly after. According to Devlin, Ford had been dealing with abdominal pain for nearly three months, but it wasn't until today that the pain became "unbearable." The tumour is not "small," but further investigations need to be completed before a treatment plan is finalized, Devlin said. Dr. Brett Belchetz, ER doctor with the Rouge Valley Health System, said that while Ford is a public figure and there is an election at stake in weeks, it was "somewhat unprecedented" to have the CEO of a hospital deliver the preliminary findings. "The way this is [being] handled is not typical, in my experience, for a benign mild condition we wouldn't be concerned about," said Belchetz. Coun. Ford declined to comment on what, if any, implications his brother's diagnosis and subsequent treatment may have on his mayoral candidacy. When asked if he would consider taking his brother's place as a mayoral candidate should he be forced to withdraw from the race, Coun. 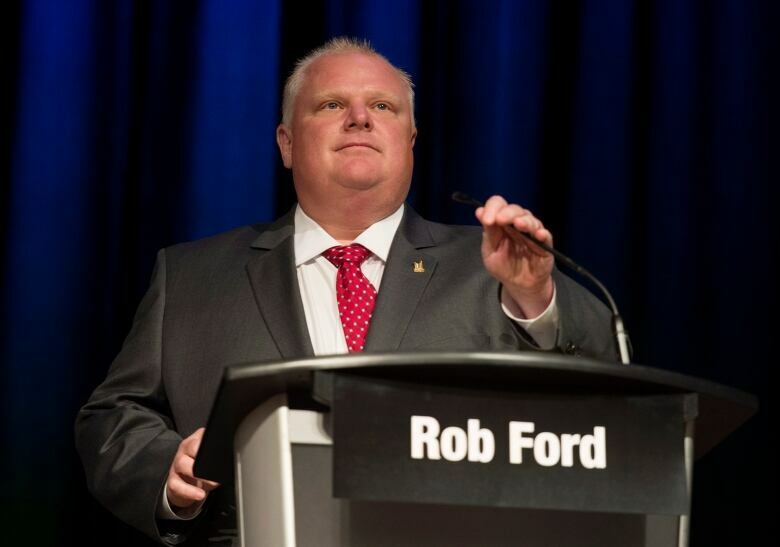 Ford said "no comment," saying that he would address the future of the campaign in the coming days. He added that the mayor "is in good spirits" and asked for privacy. John Tory, who is making a bid for Ford's job in the Oct. 27 municipal election, released a statement on Wednesday night, saying his thoughts are with the mayor's family. "While you may see us debating, we are also human beings. Rob Ford is a husband, father, son and brother and I want to see him back in good health as soon as possible and back where he would want to be — with us at the debating tables talking about the city we all love," Tory said. Fellow mayoral contender Olivia Chow said her thoughts and prayers "are with Rob and his entire family," and she called on the public to give the Fords their privacy for the time being. Chow urged Rob Ford to focus on his health. "Stay strong, we know you're strong. Don't worry about anything else. Just get well," Chow said. Ford has had several prior stints in hospital since becoming a public official. Published reports said Ford was hospitalized in 2009 for a tumour on his appendix, leading to its removal along with part of his colon which was also infected, and also that he was treated for kidney stones in 2011. In 2012, he received treatment for a throat problem that aggravated his asthma. The previous year, Ford went to hospital after suffering symptoms of kidney stones. In July, he visited a hospital for what was described as a toe injury. He was expected to be having surgery for that at a later date. While serving as mayor, Ford also launched a high-profile weight loss challenge, in which he challenged others to participate. He weighed in at 330 pounds at the start of that challenge in January 2012 and finished at 313 pounds five months later. Ford's weight could be a complicating factor in a major procedure, according to Bechetz. "Surgical procedures get very, very difficult because when you're operating on someone who is obese it's a much more challenging surgical procedure than someone who is actually slim and easy to get to things," he said. The 45-year-old father of two is in the midst of running for re-election as mayor. Ford has been at the centre of multiple controversies during his term in office, many of which related to his life outside of City Hall. In November, Ford admitted to using crack cocaine after more than a year of public denials and after reports emerged that someone had been shopping a recording that showed him using the drug. But he did not step down from his job, despite calls to do so. In the wake of the drug-related scandal, council moved to restrict his powers as mayor. The story of his drug use drew attention from media around the world and made Ford a household name well beyond the borders of Toronto. Ford spent more than two months in an addictions rehabilitation centre earlier this year,after pictures emerged, which he later confirmed, showed him with a crack pipe. After completing treatment in July, Ford said he had stopped using alcohol and crack cocaine and that he was "healthy as a horse." "If he's clean and sober, certainly drugs and alcohol would have weakened his body over time," said Bechetz. "That's going to put him at high risk for complication after [potential] surgery." "But if we're in the middle of him actively using, that actually introduces a lot of complications," he added. Ford was elected as the mayor of Toronto in 2010. He had previously spent a decade serving as a city councillor in the Toronto suburb of Etobicoke, where he lives with his family.